I saw MY SCIENTOLOGY MOVIE last year at Tribeca. Wit the film opening Friday I'm reposting the review. 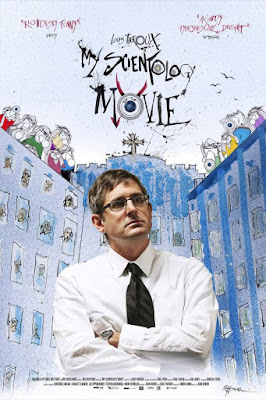 Louis Theroux wants to interview the head of the Church of Scientology David Miscavige but finds he's not allowed so he decides to investigate the Church and hire an actor to play him. The film then follows Theroux as he stages various things the Church doesn't want people to know about with the help of former members of the organization. Very good film is a perfect companion piece to Alex Gibney's GOING CLEAR since the informtion here looks at things from a more on the ground angle. The film also highlights just how nuts the Church members can be when we watch as they show up to film Theroux and try to impede him from making the film. Its a wickedly funny film at times and will make you very wary about the craziness around the Church. The film isn't perfect.There are way too many driving sequences and Theroux keeps going back to places in an effort to provoke the Church into responding. They do but after awhile I wished he would go on to something else- kind of like when Marty Rathbun, the former Inspector General of the Church asks him to stop asking the same questions over and over again. Actually the treatment of Rathbun is a problem with the film. While he is the way to know the Church's secrets he is also the guy who knows where the bodies are buried so things are not always crystal clear with him. You know things are going on behind his eyes. Theroux is aware there is a problem but he picks the worst time to confront him about it- when Rathbun is reeling from having his wife and son threatened and is highly agitated. Theroux then kind of picks a fight and has Rathbun blow up. Its the wrong way to handle it and it kind of wrecked my respect for Theroux at that point since it seemed such a jerky thing to do. Reservations about Theroux aside if you have any interest in the film go see it because thi is the sort of thing you just can't make up.